What to look for when mapping scrolled text. I originally developed the methods described in this paper for my own use. I needed a different approach to reading - a different means of accessing text that played to my learning differences and would allow me to succeed as a reader. Over the past 15 years, I have come to believe that these methods could be helpful to others as well - in particular to students who struggle with reading and to the teachers who struggle to teach them. You will find strong connections between this work and time-tested reading comprehension and study strategies (Adler & VanDoren, 1972; Holley & Dansereau, 1984; Robinson, 1961), as well as the research on graphic organizers (Hall & Strangman, 2002), and reading comprehension strategies instruction (Duke & Pearson, 2002; Harvey & Goudvis, 2000; Keene & Zimmermann, 1997; Tovani, 2000). Since 1994, I have had a number of opportunities to share these methods in the schools. I have seen them adopted by public and private schools - ranging from elementary schools through community colleges - in both regular and special education classrooms. The feedback I have received from educators has been positive. It seems that everyone I talk to at my school has heard of Textmapping before, but it was a new concept to me. I like to see the big picture, myself, so I decided to try it out and see how it works....I made a textmap of Abe Lincoln's Hat by Martha Brenner. It is a wonderful book to use in this way. The "chunks" of story are so clear, and easy to identify. I had read the book aloud to the students two times this week, and we had talked about text-to-self connections a little bit--not enough. Today I decided to guide them to look at the chunks first, then it seems we will be able to go back to connections and sensory images prompted by each section....I had them to find a partner and identify the different little stories in the big story. I gave them three minutes to talk among themselves. After three minutes, they identified the episodes, we circled them in different colors on the textmap, and worked together to give each one a summary sentence, which I wrote directly above the text....The children really were involved in the lesson. They were up on their knees with hands raised, wanting to be the next to identify an episode in the text. It was exciting to see their involvement. When we had circled all the chunks, I was amazed at how much clearer the organization of the text appeared....As long as I have been learning and using the reading strategies with a class, I have had such a challenge with charting our thinking. Making charts gets so long and involved for us. This method allows us to jot things on a sticky to add to the textmap, or even to write directly on the text. I like seeing the big picture! When I saw the scrolls, I started scanning science pages. Used 4 different sections of a science book in guided reading this week. Had to go the floor. I'm old and my knees hurt, but it was WONDERFUL. We crawled around on the floor, wrote all over the paper I had taped the pages too. One of my third graders said (of this science text written at a frustration level for third grade), I think we're really digging into the text, aren't we? Can't get better than that. 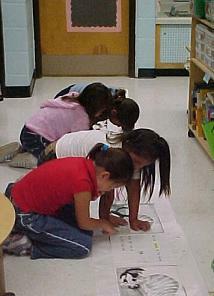 An unrolled scroll on the floor of a middle school classroom. Notice the student in the background, looking at the scroll from a perspective that, from a book-bound point of view, would be considered "upside down". Scrolls shake up our notions of reading, inviting students to interact with text in new ways that are physical, non-linear and surprisingly spatial. I used textmapping this past year for instruction in text features and structures. Although I am the ELA teacher, I introduced this to my team and students through science. We scrolled a short chapter (only 3 pages) on Pangaea and the development of plate tectonics theory. Each group of students had their own scroll and I had one at the board. We mapped the text features and I did a think-aloud with questions and connections....What was truly amazing was that after marking the text and completing the mapping, students identified the structure of the text from the features (time order)....Upon completion, we discussed author's purpose in choosing time order. The students immediately seemed to "see" that it was to show how theory is built over time (building upon another scientist's idea.) Our maps were a mess of colors...but somehow organized due to the color-coding. Now, it turns out that kids started talking about this in their other classes. As we sat down for our team meetings, my colleagues shared student comments that were occurring in their classes as a result of the textmapping lesson completed in mine....This is a terrific process! I really enjoyed yesterday's workshop and I actually used the technique today with my police academy class. (The get a 4-session mini basic skills component to their program.) It worked very well! They liked it! They want me to bring more markers and glue next time! I do think it was useful, especially with this very mixed ability group (ranging from people who would be in RS I and/or WS II to others who already have BA degrees); I was able to create heterogenous ability groups which worked well together. Read more comments from eduators. The support for scrolls and Textmapping comes from practitioners working at all levels of education, from K-12 education through community colleges, state colleges, and universities. The scroll is a continuous display format. It was common in the Ancient World before the advent of the book. Scrolls enable the reader to see an entire text at a glance. In other words, the full context is always immediately and concretely available. This is invaluable for comprehension, and unique to scrolls; no other text format offers a similar of competing benefit. Books, for example, only allow the reader to see two facing pages as a time; the full context is never immediately and concretely available but, rather, must be assembled in the abstract by the reader. This characteristic of scrolls is the foundation for the seven key instructional benefits of Textmapping. Scrolls are easy to make. 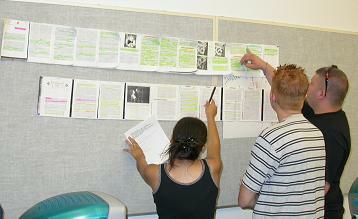 One way is to photocopy the pages of a book and tape them together into a long strip that extends horizontally in front of the reader, from left to right. Textmapping is a descriptive text marking method practiced on scrolls. It is used to describe text features in spatial terms with respect to context. The concept is based on a "boxes in boxes" or "nested boxes" model in which the user draws boxes around discernable chunks of information, thereby defining them as units. Chunks of information would include such features as chapters, illustrations, sidebars, and sections (which might be indicated by headings and sub-headings). By way of example, in order to map the section structure of a scrolled text, the reader might draw a box around each section. In the following illustration, the second section (indicated by a red box) has been further described as having three subsections. And in the first subsection of the second section (indicated by a red box), two paragraphs have been boxed - perhaps to indicate that they contain information that is important to the reader. The selection and organization of letterforms and other graphic features of the printed page is the concern of Typography. It deals with all matters that affect the appearance of the page, and that contribute to the effectiveness of a printed message: the shapes and sizes of letters, diacritics, punctuation marks, and special symbols; the distances between letters and words; the length of lines; the space between lines; the size of margins; the extent and location of illustrations; the use of colour; the selection of headings and sub-headings; and all other matters of spatial organization, or configuration. Typography includes everything that you see on the printed page. It is a visual manifestation of the author's structuring of his/her thoughts. It serves as a set of guide posts for the reader to follow - a set of handles for the reader to grab as (s)he bootstraps comprehension. Viewed in full context - as can be done on scrolls - text typography can be comprehended as a textscape (c.f. landscape). Just as every text is a unique written expression of ideas, every textscape is a unique topography to explore - a "lay of the land" accessible to the senses; a physical space shaped by meaning. Typography reflects structure at all levels. It reflects surface structure through features such as headings/sections and sub-headings/sub-sections, and the proximity and placement of text-chunks, illustrations, and other features. It can signal the relative importance or complexity of topics by way of dimensions (large/long, small/short, wide/narrow) and distributions (evenly distributed versus clustered). It also reflects deeper structure such as narrative and expository structures. It does this through the ebb and flow and distribution of words such as nouns, verbs, and "signal words" across the whole of a text. This can not be seen in a book, but it can be seen on scrolls - sometimes immediately and other times with some help from Textmapping. The following is a basic (i.e., not exhaustive) list of features to look for when mapping scrolled text. The list starts with larger-scale typographic features (which are most common in non-fiction), and works down to smaller-scale features (which are found in fiction and non-fiction alike). By way of metaphor, the textstream is like a river. It is fomed by the visual pattern of words on the printed page. Like a river, it flows in a prevailing direction; it is constrained by the physical dimensions of the paper much like a river is constrained by its banks, and it must flow around illustrations and side boxes, much as a river flows around boulders. OK. The metaphor sounds corny. But have you seen a textstream? I rest my case. terms/jargon - i.e., words that have a specific meaning in the context of the text and/or the field of the text. Adler, Mortimer, and Van Doren, Charles (1972) How to Read a Book, New York, NY, MJF. Crystal, David (1987), The Cambridge Encyclopedia of Language, Cambridge, UK, Cambridge University Press, ISBN 0-521-42443-7. Harvey, Stephanie, and Goudvis, Anne (2000), Strategies that Work, Portland, ME, Stenhouse. Holley, Charles D., & Dansereau, Donald F.; (1984), Spatial Learning Strategies: Techniques, Applications, and Related Issues, Academic Press. Keene, Ellin O., and Zimmermann, Susan (1997), Mosaic of Thought: Teaching Comprehension in a Reader's Workshop, Portsmouth, NH, Heinemann. Robinson, F. (1961) Effective Study, New York, Harper & Row. Tovani, Chris (2000), I Read It, But Don't Get It, Portland, ME, Stenhouse.